Gone are the days when you are limited to baby diaper bags that shout “baby diaper bag.” If you’re looking to transform your favorite tote or backpack, then a diaper bag organizer insert can transform your designer purse or sack in a pinch to accommodate your baby’s travel essentials—or yours. Check out some of the best diaper bag organizers here! With the ability to transform your purse into a baby diaper bag, you don’t have to choose between practicality and fashion sense. A diaper bag organizer affords you not the perfect compromise, but a way to be a 100% practical and fully equipped parent and a 100% fashionista. And, of course, if you’re simply looking for something to organize stuff in a dedicated baby diaper bag, then they’re perfect, too! This diaper bag organizer comes with six partitions that can accommodate a range of baby stuff, from feeding bottles to diapers and changing pad to snacks. And since the bottom part of the partitions is not attached to the bag, it makes each compartment versatile. Aside from the inner partitions, the KF Baby Diaper Bag Insert Organizer comes with four external pockets to expand its carrying capacity and organizing feature. Whether you need more space for your baby’s stuff or yours, they have you covered. With durable and waterproof fabric, this diaper bag insert is perfect to carry damp and dry items. To clean it, simply wipe it with a damp cloth and let dry. 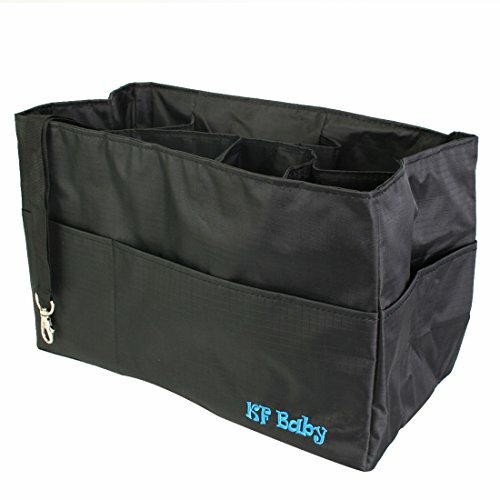 The KF Baby Diaper Bag Insert Organizer measures 12 x 6.4 x 8 inches allowing you to fit it in a range of bags. And weighing only 9.6 ounces, it doesn’t significantly add much to the weight of your bag. The KF Baby Diaper Bag Insert Organizer offers six inner partitions and four outer pockets. It is lightweight and compact making it a perfect organization tool for a wide range of totes and even backpacks. This black diaper bag insert is made of a waterproof material that provides a second layer of protection for your favorite purse. Need help with organizing your stuff in a roomy purse? 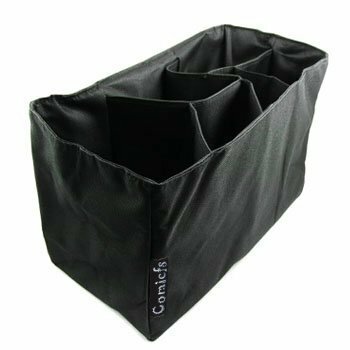 Find what you need in a jiffy with this diaper bag organizer that offers six compartments. 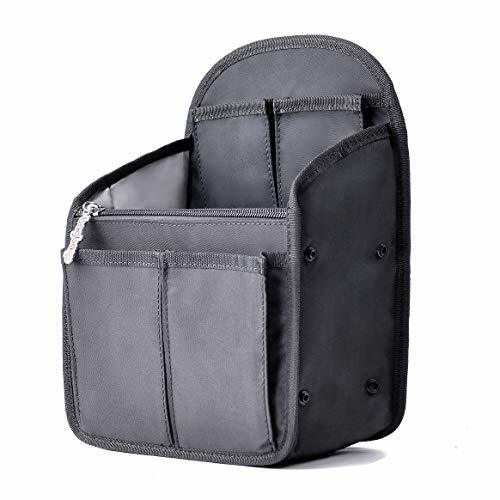 Whether you’re looking to transform your favorite purse into a carrying bag for your baby’s essentials or yours, this black diaper bag insert makes for a great organization tool. With a durable and water-resistant fabric, this diaper bag insert is easy to clean. Just wipe with a damp cloth and let dry. Whether you intend to use it to organize stuff in a tote bag or backpack, this 12 x 6.4 x 8-inch bag is likely to fit. And since it barely tips the scales at 6.1 ounces, it will not add considerable weight to your bag. The most affordable diaper bag insert among the three items in this article. The Comicfs Baby Diaper Bag Insert Organizer is a great way to organize stuff in your purse. Its six partitions save you from the headache and frustration of fumbling through a roomy bag. Structured yet soft, it affords you lots of versatility, making it a good fit for a range of totes and backpacks. Unlike most insert organizers, this one by BES CHAN comes with a high-back design that makes it ideal for backpacks. It gives the pack structure when inserted inside. And with its foldable design and snap-on fasteners on the side, it packs to a slim size that lets you store it with ease. The BES CHAN Backpack Insert Organizer comes with a variety of compartments and pockets—two of them zippered, four elasticized, one meshed, and the rest open. Plus, they come in various sizes to accommodate large and small items as well as thin and thick articles. The backpack insert is made of premium Nylon that’s soft, pliable, and waterproof. The backside is fitted with a PVC board that keeps the insert standing straight in your backpack. The insert is integrated with a wide handle at the back that lets you conveniently put it in and out of your backpack. The BES CHAN Backpack Insert Organizer comes in four sizes: mini, medium, and large. The mini version measures 7.9 x 4.7 x 10.6 inches and weighs 214 grams. The medium size has a 9.06 x 5.5 x 11.82-inch footprint and tips the scale at 320 grams. The large one measures 10.8 x 5.5 x 13.8 inches and weighs 345 grams. Aside from the rounded edge back design, it also comes in a version that’s perfect for boxy backpacks. Unfolded, it measures 10.8 x 5.5 x 13.8 inches and tips the scale at 328 grams. The BES CHAN Backpack Insert Organizer is a multi-pocket insert organizer that’s useful for mommies, daddies, and even your kids. It comes with 14 compartments of different sizes. And coming in three sizes, you’re sure to find one that fits your backpack. Depending on the kind of purse you’re looking to convert into a diaper bag, you’re bound to find your match in any of the three. The KF Baby Diaper Bag Insert Organizer and Comicfs Baby Diaper Bag Insert Organizer are perfect for tote bags. They can also be used for backpacks, too. But if you’re looking to add form to a backpack aside from significantly increasing its organization capability, then the high-back and 14-compartment BES CHAN Backpack Insert Organizer is what you need. Plus, it comes in three sizes. This makes it great for mini to large backpacks. So, which of the best diaper bag organizer appeals most to you?